A New Horizon prompt | Digging the pond! OOC: Featuring Abigail, Ajax, Cicely and Harrison! Digging the pond. Feel free to occupy the kids or help Abi out! There is a stream in the spot, but it's not yet a pond. Start digging it out, save the stones for the pathways that will mark the sidewalk for our new village. Armed with an old shovel and the promise from her children that they wouldn’t hinder her work, Abigail had made her way out to where the bare bones of a new housing location had been set down. Some headway had been made – enough that the stream was easily accessible now – and the Archiduchessa felt pride well in her chest for the work her pack mates had already put into the project. After all the bloodshed and pain of the Winter it felt good to be embarking on something new – to be building for the Court instead of battling to keep them together. For the first time in a long time, as the Sadira woman looked over the site, she felt optimistic. There was still much work to be done but they had a clearly marked direction to go in. Abi moved with care, treading over damp grass to the edge of the stream. This narrow waterway was destined to be something larger, more tranquil – perhaps something a little like the Grand Lake Abigail had grown up near. Cicely and Ajax trailed behind her and even they seemed excited by the promise this new location held, though it was difficult to tell excitement from the energy of youth. Abi leaned on the shovel for a moment before sinking it into the mud with a satisfying squelch. It took some easing past stones that didn’t want to yield – but those could come in handy later. A scent wafted to the working wolf and she looked up to see a now-familiar face. The man usually seemed grouchy and for a moment Abi thought she might be rebuked for digging at the banks – but when the mason set eyes on the children he offered up a smile and crouched down to greet them. A splash made Abigail’s head whip round and a groan left her. “Ajax!” Sopping wet, tail wagging, the pup smirked at his Mother. To Abi’s surprise, Harrison chuckled. She thought it was the first sound of mirth she’d heard from him in some time and it was enough to prematurely halt the scolding which was about to emerge from her lips. To Ask, who had already lost too much as a pre-teen still finding his legs, grief was a funny sort of thing. Showing his maturity for his age, he went through an exaggerated period of despondency, but when it came down to choosing sorrow over survival, he found that he could no longer think about what was gone. It had come time to think about what was going to save him. Or who. He didn't have to think long before he realized that the only one who could rescue him now was himself. A very adult thought for a boy whose ribs had become visible during the drought of his mourn. He fed himself first. A mouse was a meager meal, but he'd been proud to catch it in his state, and it was a decent mouthful for now, given how empty inside he felt. His stomach certainly felt better, and with the little energy he had gained from eating, the too-skinny Prince milled about in a subtle effort to find something that would keep him from returning to his depressing hole-in-the-ground bed. A splash and a shout drew him in to the place being excavated for a new Court village. He stood half-hidden by a tree in the middle-distance, and he regarded the group with equal interest and wariness as he observed the activity they'd taken up. He recognized each of them in passing, even if he had not bothered to retain their names. He knew only the tall lady's name -- Abigail -- and that was because Dove had, at one point, pointed her out as leadership. And hadn't one of those children been kidnapped, like himself? He understood the concept better now, even if he no longer had any recollection of where he'd originally come from or who his true family was. He wondered why those kids weren't all messed up from the experience like he was. Why did they get to be so happy? Grief reared its ugly head, making his chest ache with longing as he watched the two adults bathe the younger kids with their attention. And as much as it hurt him to watch, he simply couldn't look away. How the seasons melted so fluidly from one into the other had always enthralled the wolfdog. With only a few unseasonable hiccups, which Reblin knew from the beliefs of his birthplace to be the tricks and jokes one Season played on another, the snows and cold of winter had long disappeared. Now, with the sun warm and bright in the cerulean sky, Sister Spring commanded the trees and the earth and the flowers to awaken from their long slumber and return the world to verdant brilliance. Padding along on four thick legs, Reblin started for the Court's new housing site in his hulking halfing form. Secure in his mouth was a mallet — his mallet. Thyri had cursed when she realized that she'd accidentally brought it back to the hotel room with her. But where his friend considered the accident with unenthusiastic reluctance to face the surly carpenter, Reblin saw it as an opportunity. Despite Callista's thoughts on the contrary, the pied wolfdog felt certain that he was starting to grow on Harrison. And if he returned Harrison's missing mallet back to him? Slipping his tongue out between the handle of the mallet and his parted maw, Reblin let his tongue flop all around as he ran. Oh yeah, he was definitely getting brownie points from Harrison after this. Picking up his pace, Reblin nearly collided with the scrawny little Prince as he approached the site. "Woah! Woah!" he yelped, scrambling to slow his momentum but failing spectacularly. Losing his footing, the beastly man tripped over his paws and toppled theatrically to the sodden earth with a soft oof! In the chaos of tripping and skidding to a half, the mallet was knocked out of his mouth and disappeared from Reblin's sight. Laying in a pool of his own disappointment and regret, Reblin craned his neck toward Ask and grinned sheepishly. "Pretty good reflexes though, right?" he said despite himself, his curled tail thumping against the ground. Determined as Abigail was to make headway on digging out the pond, she couldn’t help standing for a moment and watching her children. She was ever watchful of them, perhaps more than was necessary. The woman was always alert to changes in their body language and demeanour which might signal the resurfacing of trauma. Right now, greeting Harrison with wagging tails and wiggling bodies, there was no signs that either child had been kidnapped. No signs that they had watched their Grandfather be mutilated. Those signs would surface later, when the night drew in and the light faded. They would twitch and cry in their sleep and Abigail knew they would be running from demons in their nightmares. All was not as it seemed with the happy little family. The head of the shovel sank into the mud again and Abigail felt the tremor as she struck a large stone buried beneath the squelching dirt. “Harrison, a hand?” she requested, wearing a strained smile as the pups bounded off toward some scent or other. With a grunt the mason came to help in heaving the stone out of the mud. For a few moments they worked in silence to ease the stone from its cradle of slick mud. Some distance away Cicely let out a yip which made Abigail look up sharply, her ears flattening. She temporarily abandoned her task, jogging towards the patch of trees her puppies had disappeared into. Ajax emerged first as Abi approached, a mallet in his jaws, looking considerably pleased with himself; his sister, meanwhile, was play bowing at a youth Abi recognised as Gossamer. The Archiduchessa dipped her head and offered the Prince a warm smile. Her eyes fell on Reblin, sprawled on the ground, then, and one brow hitched up. Ask fell into a wormhole of thought. His independence and self-removal from others had taught him to come up with his own answers -- and his age prevented him from seeing any personal short-comings on any matter. It was always someone else's fault. Gossamer was jolted suddenly -- ran stiff by an internal trill surging through him -- and he acknowledged too late that someone was upon him. He watched, alarmed and grimacing, as one of his packmates went tumbling into a sprawl, having just missed tripping over him by a slim margin. He didn't know the male personally, but had spied on him from a distance; admiring his broad musculature and wanting it for himself. He was so haggard these days, it didn't seem like he'd ever be a decent a size. But his growth spurt was to be a surprise yet. His face of horror and disgust melted, and while he tried to look indifferent, he mostly just looked annoyed. If you're a plant, yeah, he snarked, wanting to establish right away that he didn't need no stinkin' friends. Not him. Never would. Not no way. Not no how. He might've further sought to dig his social hole, but he was distracted by the cynosure presence of one of Abigail's children. Green-eyed and luring, the girl gave him a signal that felt distant and almost foreign to him. Gossamer lifted a paw tentatively, and his ears fell back. Instinctively he wanted to accept. There was something natural about her appealing him to play -- he immediately felt like he could trust it. But mentally he fell victim to past traumas, and he made no move to either engage or rebuke her. He only looked confused, maybe nervous, like he didn't know quite what to do with her invitation. The stately Archiduchessa appeared then, and the boy took an uncertain step back. Join them? Join what? he asked, his voice heavy with a skepticism far too old for him to be carrying around. Never one to take anything too personally, let alone judge others for their reactions, Reblin only laughed in response to Gossamer's annoyed retort. His tail thumped harder and he flipped his body up from its formerly recumbent position, laying now with all four paws beneath his hefty body with his tongue flopped out of a smiling mouth. Curled over his back now, his tail continued to wag. "Yeah, I'll be quicker next time," he promised, as though implying that there would even be a next time. "Hey, you didn't see where that mallet went, did ya?" he asked of Gossamer, pale eyes flitting around them. He rose to his feet to search, then paused when the sounds of rustling reached his ears. Wagging his tail slowly, Reblin sniffed at the sounds and then jumped back when the puppies emerged. He managed to catch sight of the Prince with the mallet clenched between his jaws before Ajax disappeared again. "Ah!" he gasped, scrambling to give chase but tripping over his feet again. "Hey wait!" But the boy was gone, replaced by his sister attempting to engage in play with Gossamer. Harrison was going to kill him if Ajax ruined or lost his mallet. While Cicely invited Gossamer in play, and Reblin mulled over the thoughts of his impending demise, their Archiduchessa made an appearance. 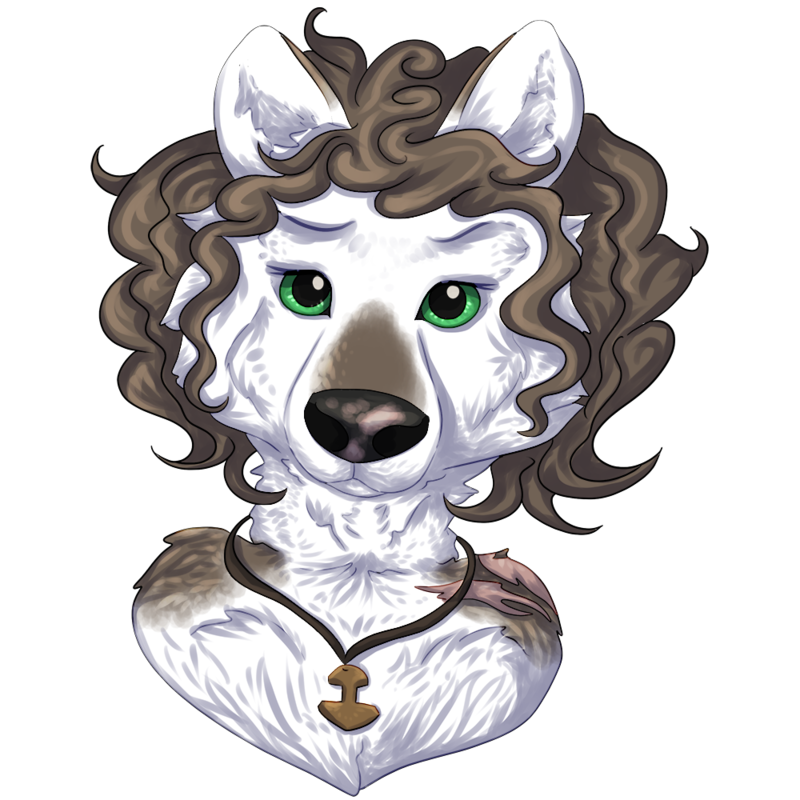 Looking up at the woman – Thyri and Gaia's older sister, he reminded himself – with a theatrical expression of doom in his eyes, the wolfdog said, "If you'll protect me from whatever Harrison's gonna do to me when he finds out I lost his mallet, I'll do anything for you." Reblin was nothing if not dramatic. OOC: I think Cicely has a puppy crush on Gossamer bwaha. And lolll Reblin! Abigail’s initial impressions of Gossamer were that he was quiet, much like the woman who had brought him to the Kingdom in the first place. Some concern tickled at the back of the Sadira woman’s mind, though; the truth was that she hadn’t much gotten to know either Dove or the Prince she’d found a haven for within the Court’s borders. With everything that had happened over the Winter, Abigail had been distinctly preoccupied. She had to try harder to know everyone in the Court – partly because that was her job and partly because Abigail didn’t know the meaning of a lost cause or a friend not worth making. Whether the boy froze because of Cicely’s invitation of play or because of Abigail’s appearance the Archiduchessa didn’t know. He responded to her invitation to join them – with a tone saturated with skepticism. Abigail responded with a smile. Cicely shot her Mother a glare but Abi didn’t catch it. Her gaze had shifted to Reblin, who seemed to have lost his limbs under himself for the second time, and she smirked at his dramatic plea. Straightening her back and lifting her chin, for a moment it seemed that Abigail might consider her sisters’ friend’s behaviour improper. During that moment of consideration she might’ve looked haughty, even regal – like the Princess she had once been. Her chin dropped and her arms crossed over her chest. She tilted her head. A gruff, “Hey, kid, what you got there? !” told the quartet in the tree line that Reblin had not been lucky this time. Luckily for Reblin, the thing that Abigail was asking them to join her with was something that he thought himself quite good at. Digging? Pfft, that was easy. The magnitude of just how much digging it would take to make a pond, however, would be lost on the wolfdog until he could see precisely what was needed. So, his tail thumping against the earth, Reblin expressed his gratitude to the Archiduchessa when she agreed to his conditions. Unluckily for Reblin, he did not intercept Ajax before Harrison realized that he had lost his mallet. Lifting his head abruptly, his large ears tall atop his head, the wolfdog's pale eyes grew wide as he listened to the gruff voice questioning the little Prince. "Oh, I am so dead!" Reblin groaned, scrambling to his paws and making a beeline for the construction site. He dashed through the thicket of trees and brush that had been shielding them, thorny branches pulling away clumps of fur, and emerged to see exactly what he was dreading. Laughing nervously, Reblin approached Harrison slowly, his submissive posture making him look very much like an enormous puppy. "Hey Harrison!" he called out in a howl. "This isn't what it looks like," he promised. And then, emphatically and with a great deal of elaboration, Reblin wove the tragic tale of just how Ajax came to end up with Harrison's mallet. "So, I mean, it was totally an accident!" he said, supplication in his eyes as he looked up at the gruff wolfdog. Turning his head toward the treeline, Reblin looked to see if Abigail was coming to keep her word. "Um, so, anyway, now that you have your mallet back, I promised Abigail that I'd help dig the pond. So I'd better, ya know, get to it." He attempted a grin but it looked more like a grimace. Abigail wasn’t scared of Harrison – not at all. She was utterly convinced that deep down he was a teddy bear, that his gruffness was concealing an endearing softness. The Archiduchessa found it easy to perceive things that way in spite of all that had happened. Even so, her heart thumped a little when she heard the mason call out to Ajax. Reblin had been rumbled. 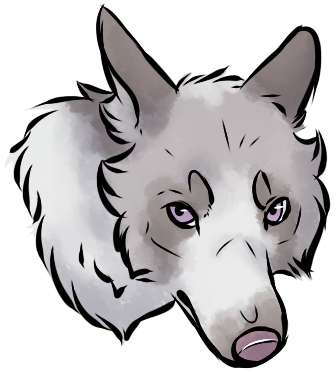 Torn between amusement at Reblin’s predicament and the desire to protect the jovial youth from any repercussions, Abigail turned and followed in the wolfdog’s wake. She could hear the dramatic telling of the younger male’s story as she made her way over and by the time she stood before them – slightly in front of Reblin, as if to shield him from Harrison’s wrath – her eyes were bright with mirth. Reblin was a good egg – a funny one, but a good one. Harrison’s eyes were hard and sharp as flint and Abigail sought to appease him with a warm smile. “What do you think, Harrison? 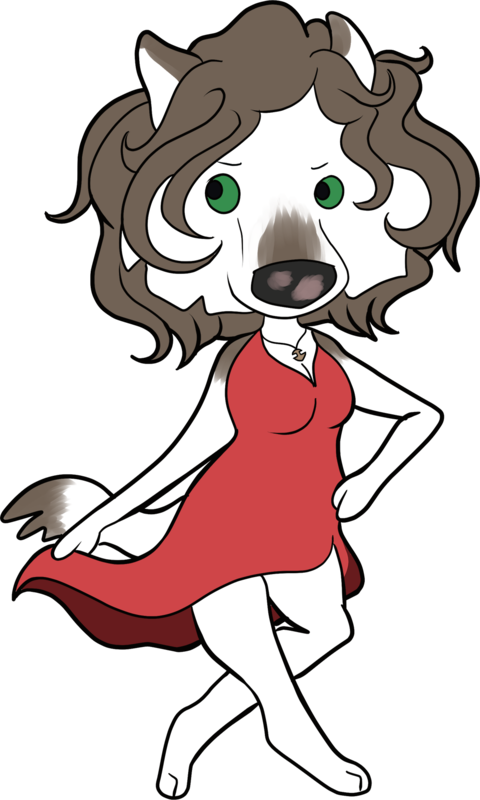 How about we let Reblin get to work?” Her tail wagged once and she nudged Reblin with one pale hind paw, urging him to move off and start his digging. She didn’t think Harrison would actually strike the exuberant young man but she was keen to diffuse the situation before it built up. “Ajax, that belongs to our talented mason,” she muttered, beaming at Harrison. The man seemed to consider the Archiduchessa’s behaviour for a moment before grunting, holding out his hand for the slightly damp tool. With order restored Abi turned, to survey the would-be pond. “This’ll look beautiful once it’s all dug out,” she gushed, moving toward the little stream and sinking her retrieved shovel into silt and mud which was mercifully free of large chunks of stone – this time. Harrison was still staring in disdain at the slightly chewed mallet handle but he shook himself and stepped over to the stream’s bank. “Line the pathways what'll be most used, perhaps,” the man gnarled. There was Abigail, like an angel come to his rescue. His tail wagged a little harder. Though Reblin was putting on a great show of concern and apology, he was more worried that Harrison's favor in him would be soured than he was that the gruff mason might physically cause him harm. As far as the wolfdog was concerned, it was considerably worse to be ignored or disliked than it was to be beaten to a bloody pulp. With the Archiduchessa's gentle nudge, Reblin glanced at her with grateful eyes and then, flicking another silent apology to Harrison, he padded away to begin digging. Reblin could have shifted into his two-legged form and acquire hands to grip a shovel, but he remained as he was and began clawing at the streambed with his front paws, pulling up clods of sodden soil and clay and discarding them between his back legs. He had little regard for precisely where the dislodged mud was going, but made sure that he was aiming it away from the stream itself. What good would it do, after all, if he was digging a hole only to have his dirt fill in another part of the future pond? As he dug, front paws scraping away the silt, Reblin felt is mind clear. This sort of work was pure and serene and felt delightfully intrinsic. It wasn't until his nails met something hard and immovable that he was drawn back from his reverie and into reality. He blinked, and tried without success to dislodge the large stone he had dug his way to. "Uhh." He glanced up from his hole, grinning at Abigail and Harrison. "I got a rock here! Could someone help me get it free?" Grinning, Reblin wagged his curled tail hopefully.